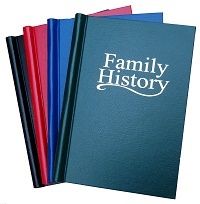 The perfect way to print and present your family history in book form. 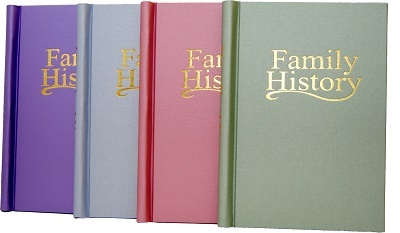 This new range of springback book binders in metallic pastel shades printed with 'Family History' on both the front cover and spine creates a modern finish for your family history which can't fail to attract the attention of younger family members. **** IMPORTANT NOTICE ****** Customers who have previously ordered the purple binder - please note due to a manufacturing change these binders are now paler more akin to lilac !!!!! Not only is this a new range of colours but the cover is made from a hardwearing coated cloth thus ensuring that it has a good chance of still being around in 100 years and beyond. Allows you to bind up to 150 A4 pages (90gsm) by just folding the cover back on itself, inserting the pages and when the cover is closed the edges of the pages are gripped tightly. 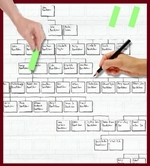 You may remove and re-insert the pages as many times as you like thus allowing your publication to grow over time. There are no holes to punch and the quality and feel of the finished work is more like a book than any ring binder. 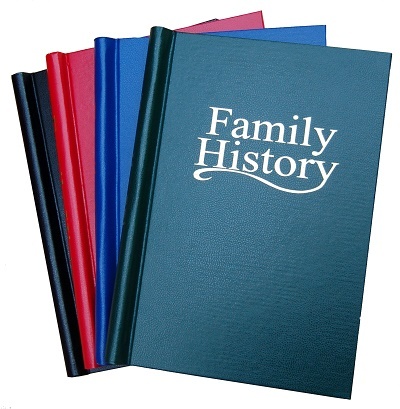 These binders help you make the perfect gift when presenting a printed family history to other members of your family. If you wish to print your pages before purchasing the binder don't forget to allow a 32mm (1 1/4") margin down the edge of the paper.